This lovely 20 inch AUTHENTIC TURQUOISE NECKLACE AND PENDANT features a 3/4 x 1 inch Royston turquoise cabochon mounted in sterling silver. The necklace has matching turquoise barrel beads, sterling silver Hill Tribe beads, a sterling silver twist open chain, and a sterling lobster clasp. 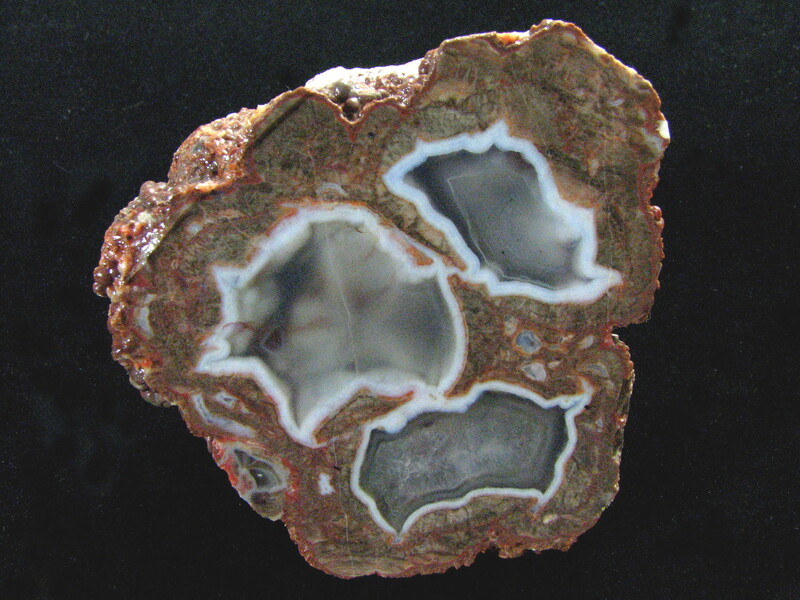 This unusual Baker Mine Agate features three distinct chambers. Each is surrounded by white fortification banding. Measurements are 65x65x63 mm. Photographed wet. 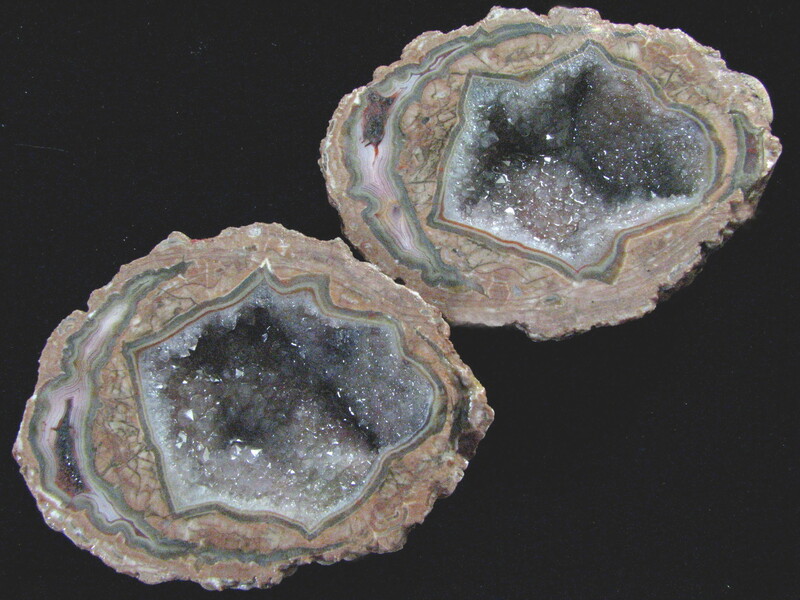 This beautiful Baker Mine Geode from New Mexico features a sparkling amethyst crystal pocket surrounded by an exotic array of pink, brown, and amethyst banding and fortifications. Measurements for the geode are 57x75x55 mm. Photographed wet. This is a solid, rare, and difficult to find Balmorhea Agate Lapidary Slab from Balmorhea, TX. It features blue, black, and white colors, a quartz core with a white druzy quartz pocket, and water line bands. A rare find these days. Measurements are 2.25×2.5×3/16 inches. This charming Beaded Pearl Necklace with Hammered Heart Pendants features a sterling and a copper heart accented with two dangling pearls. The 18 inch necklace is 6mm pearls with a sterling heart toggle clasp. Matching sterling post earrings have a one inch drop. This lovely Beaded Tourmaline and Sterling Charm Bracelet features two tourmaline strands, one sterling faceted nugget bead strand, a handcrafted sterling stamped charm, and a sterling toggle clasp. Size is 6 3/4 inches. These are assorted Biggs and Bruneau Jasper Designer Cabochons from Oregon. The price is per cab. Please click “CONTACT US” and send an email if you need the exact dimensions or a more detailed description of the cabochon you like. After completing your purchase, please email us the number of your cabochon and it will be shipped. This Biggs Jasper Designer Cabochon from Utah features lovely patterns and black plumes. Measurements are 6 x 36 mm. 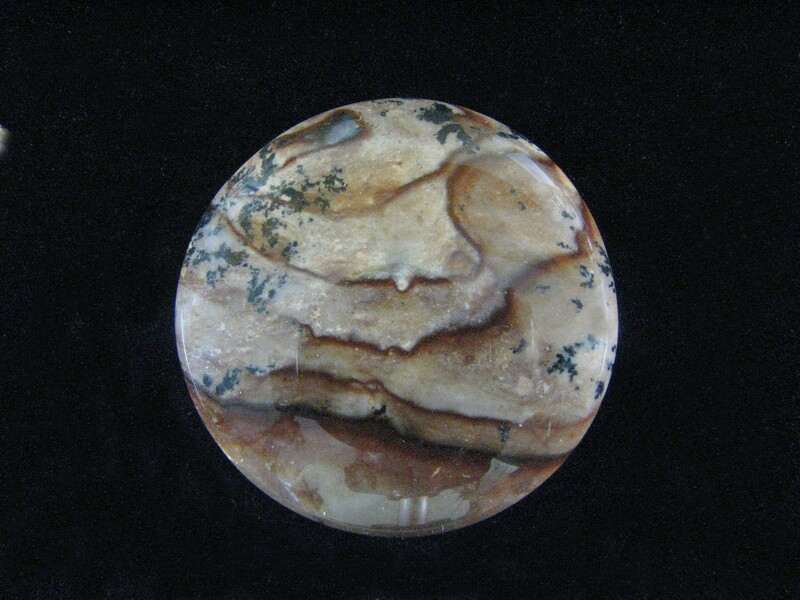 This scenic Biggs Jasper Lapidary Slab geatures rolling hill scenes accented with black dendritic features. Measurements are 3/16×2.75×3.5 inches. Photographed wet. This Biggs Jasper Lapidary Slab is from Oregon and features a variety of interesting inclusions and cabbing sites. Measurements are 3/16×2.5×3.5 inches. Photographed wet. This Biggs Jasper Lapidary Slab from Oregon is loaded with scenic rolling hill features and is an excellent specimen or cabbing piece. Measurements are 3/16x2x3.5 inches. Photographed wet.